Pelican's Nestle Inn - fully self-contained holiday units and townhouses situated in the heart of Wynnum, on the waterfront opposite Pandanus Beach and the Water Park with great walks along the Foreshore. 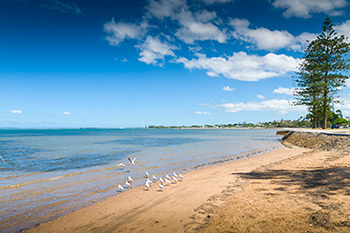 Overlooking the Wynnum Wading Pool, Moreton Bay and with panoramic views of Moreton, Stradbroke, St.Helena, Peel and Green Island. The Pelican's Nestle Inn is five minutes walk from local shopping, cafe and restaurants and only a thirty minute train ride from Brisbane city. We are only five minutes drive to Royal Queensland Yacht Squadron and ten minutes to Brisbane Aquatic Centre at the Sleeman Sports Complex at Chandler. Port of Brisbane is the neighbouring suburb and fifteen minutes to the Brisbane Airport. For Manly accommodation and Wynnum accommodation you won't find better than the Pelican's Nestle Inn available overnight and weekly.